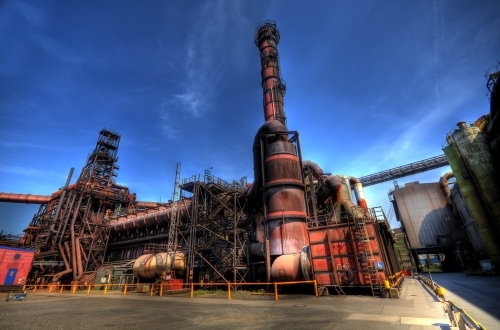 Steel manufacturing giant ArcelorMittal is to explore the industrial-scale use of hydrogen in the steel production process for the first time. As part its strategy to reduce CO2 emissions, hydrogen will be used at the firm’s Hamburg plant for the direct reduction of iron ore. The hydrogen-based reduction of iron ore will initially take place on a demonstration scale with an annual production of 100,000 tonnes. A pilot plant is to be built in the coming years. Already today, the Hamburg plant has one of the most efficient production processes of the ArcelorMittal Group due to the use of natural gas in a direct reduction plant (DRI). “Our Hamburg site offers optimum conditions for this innovative project: an electric arc furnace with DRI system and iron ore pellets stockyard as well as decades of know-how in this area. The use of hydrogen as a reducing agent shall now be tested in a new shaft furnace,” said Frank Schulz, CEO of ArcelorMittal Germany. In the process, the separation of H2 with a purity of more than 95 per cent from the top gas of the existing plant will be achieved by so-called pressure swing adsorption. The plan is to initially use grey hydrogen (generated at gas separation) but in the future the plant could potentially use hydrogen generated from renewable sources, according to the company. The effort is one of a number of initiatives underway at the company aimed at reducing carbon emissions. For instance, at its Ghent plant waste carbon gases will be used for the production of alternative fuels or in chemical products. Likewise, methods are tested in which biocoal from waste wood is used instead of coking coal as a reducing agent in the blast furnace.